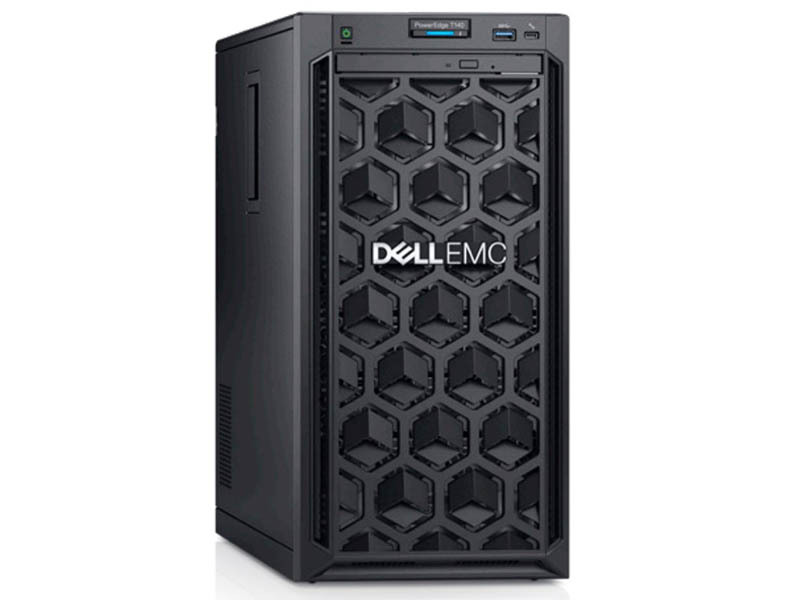 If you are looking for the lowest cost tower PowerEdge, the Dell EMC PowerEdge T140 may be your answer. 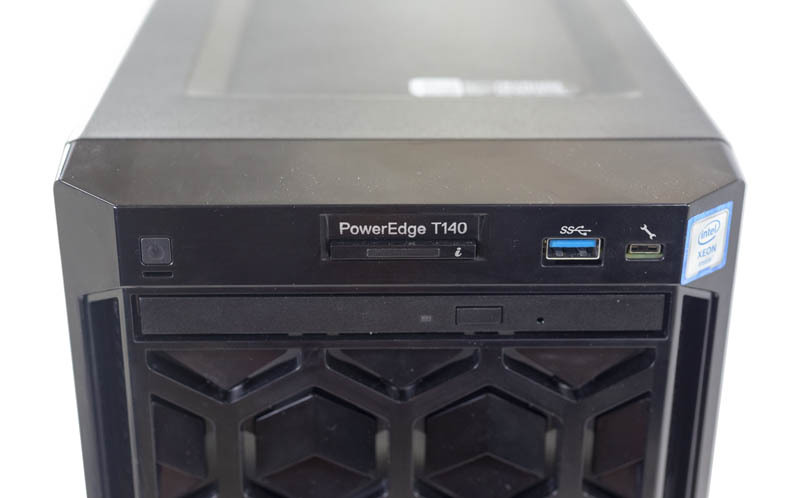 In this review, we are going to take a look at the PowerEdge T140 from a number of different angles. We are going to delve into the hardware that makes the system tick. Many administrators will like the fact that the Dell EMC PowerEdge T140 utilizes the familiar iDRAC 9 for management. During the process, we will also test the PowerEdge T140 and see how it performs using a number of different processor options that you may configure. In the end, we are going to see how the Dell EMC PowerEdge T140 stacks up to its competition. When it comes to stature, the Dell EMC PowerEdge T140 is a relatively petite mini tower measuring 360mm x 175mm x 454mm. Front I/O does not include traditional hot swap bays. Instead, one has USB and service connectivity along with a slim optical drive bay. Some servers in this class are built completely bare bones. 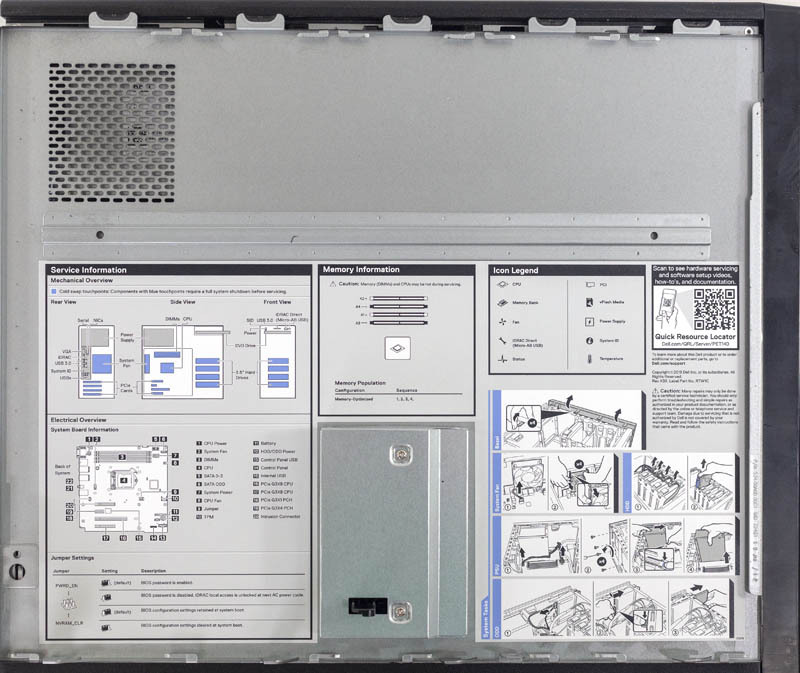 Sheet metal is wrapped around a basic motherboard sometimes with screws and sharp metal in this class of machines, but not with the PowerEdge T140. 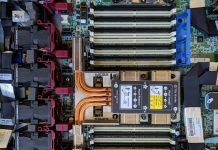 The PowerEdge T140 gives its first clue that low cost does not necessarily mean abandoning the company’s principles of quality as one looks to open the chassis. Here, there is a nice latching mechanism that is easy to operate. In contrast, many competitive systems, even from large vendors, utilize a simple sheet metal side panel held by screws. Although this may seem like the most inconsequential feature at first, this is clearly a cost adder that the Dell EMC product team rightly designed in for the purpose of giving a user a quality experience. Inside the chassis, we can see the basic layout of the system. There is an mATX side motherboard, an ATX size power supply, an optical bay and four 3.5″ drive bays. The 3.5″ bays are cabled and in tool-less trays. 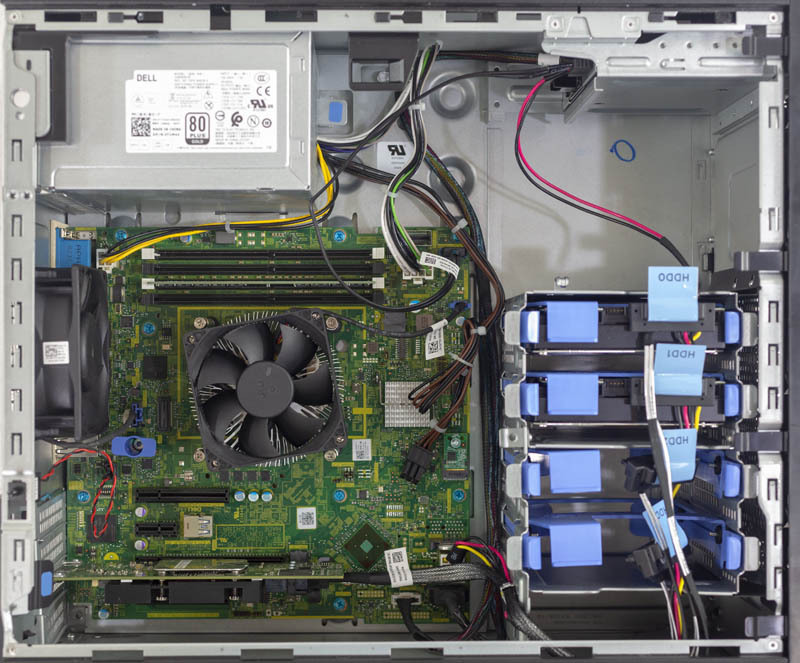 These are not traditional hot swap bays as there is more involved to swap drives. 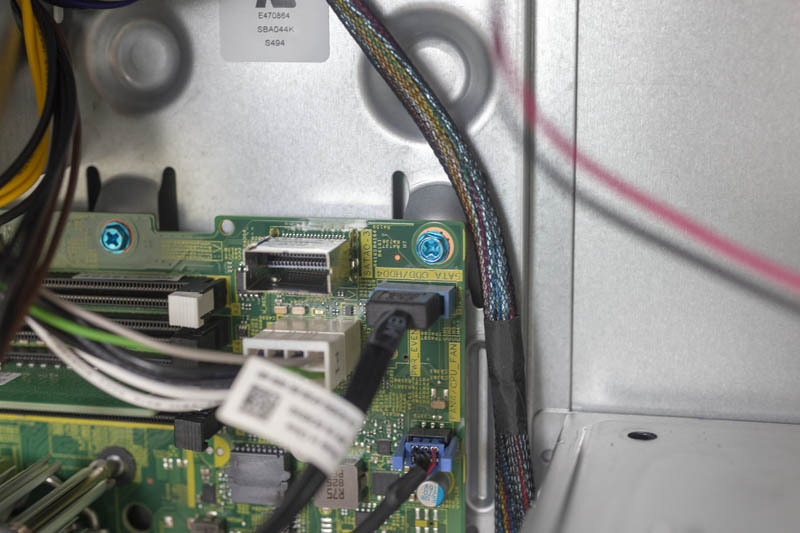 At the same time, this type of solution is common in this class of machine and it is usually easy enough for a novice IT admin, or a reasonable on-site employee to swap drives. Another quality area is that the drive connections are labeled with large lettering so they are easy to read. For those with limited eyesight who are installing drives, the small step of having large labels makes the process easier. Typically, one would use the motherboard’s onboard SATA controller for storage at the ultra-low-cost segment. One can see a SFF-8087 header that can provide up to four SATA III 6.0gbps lanes. The SFF-8087 connector is often associated with SAS, but this port is SATA only. One can also see a traditional SATA III 6.0gbps 7-pin SATA port that is labeled for either the optical drive or another hard drive. PCIe connectivity is provided through a series of four slots. We have a PERC card pictured here. 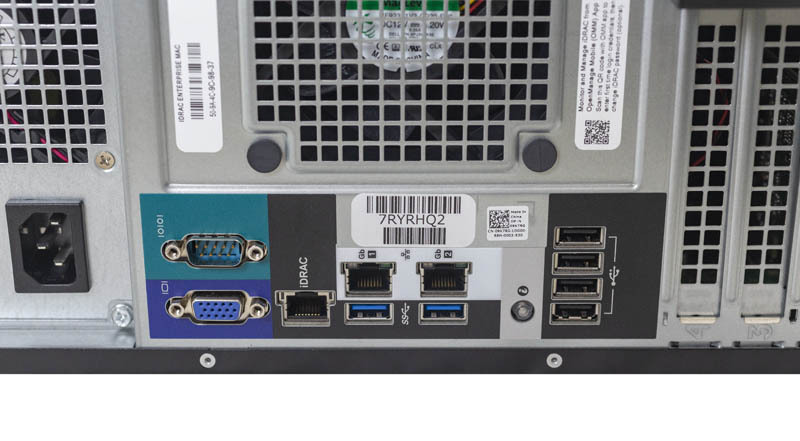 One note is that there is not an onboard M.2 PCIe slot. M.2 has become a popular NVMe SSD form factor in servers. Dell EMC allows the use of a BOSS card with one or two SATA M.2 drives for boot, but NVMe drives are for a different use case and offer more performance. With this class of server, I/O connectivity is limited by Intel’s underlying platform. 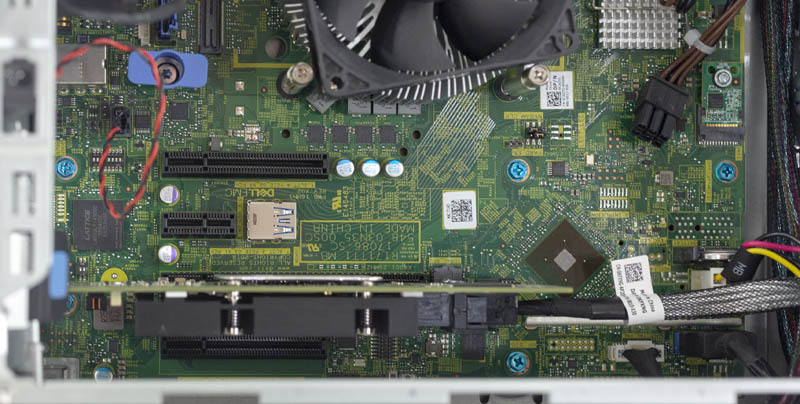 If you want more PCIe connectivity, you will go to higher-end products like the Dell EMC PowerEdge T440 based on Intel Xeon Scalable. 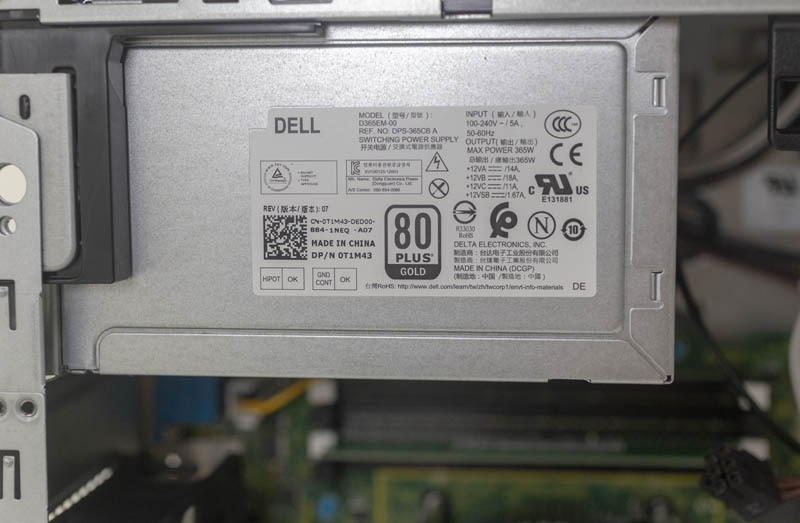 For the power supply, Dell EMC uses a 365W unit that is 80Plus Gold rated. For sub 500W PSUs 80Plus Gold is still considered very good. There are competitors in this class using Bronze or non-rated PSUs. We commend Dell EMC for going with an industry standard efficiency rating PSU here to assure buyers of lower operational costs. 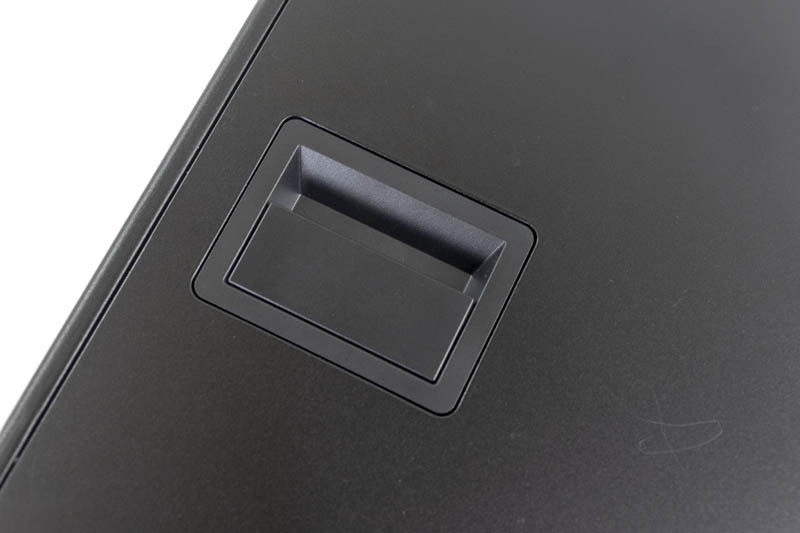 The rear I/O panel has a traditional serial port, VGA port and four USB 2.0 ports for the legacy I/O. One also gets two USB 3.0 ports each sitting below one of two 1GbE port. Dell EMC again went the extra step and have a dedicated iDRAC port for out-of-band management that we will focus on in a later section. Before we end the hardware overview section, one other area that should be mentioned is documentation quality. Dell EMC has solid online documentation for IT admins. Designed for edge deployments, the Dell EMC PowerEdge T140 is also designed to be serviced by non-IT onsite staff. Here, simple features like stickers with pictures and pertinent service detail makes a big difference. If you review a lot of servers as we do, it is fairly easy to see that the Dell EMC PowerEdge T140 is designed to be budget friendly. At the same time, the PowerEdge team did a great job balancing costs while still making the lower-cost system feel well built. There are small features we highlighted such as the latching mechanism and labels that contribute to the overall quality of the PowerEdge solution over other alternatives.